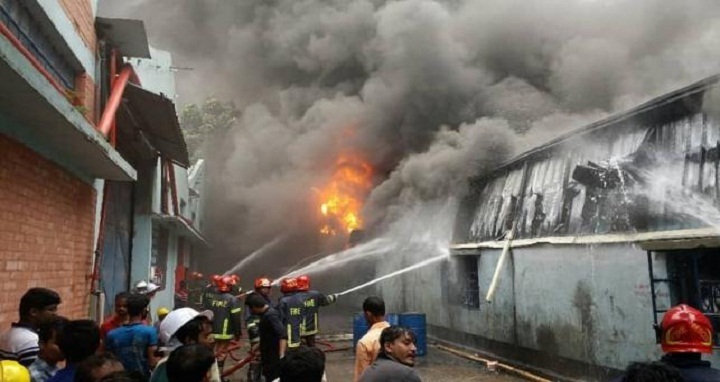 Dhaka, 3 July, Abnews: Two persons sustained burn injuries while dousing a fire that broke out at a foam factory and its warehouse in Borobari area in the city early Tuesday. The identity of the injured could not be ascertained immediately, said Md Jakir Hossain, senior station officer of Joydebpur Fire Service and Civil Defence. The fire broke out at 'Banjing Bangladesh Limited' around 5am and engulfed the adjoining warehouse, he added. On information, six fire-fighting units from Joydebpur, Tongi and Uttara stations rushed there, and doused the fire around 10:30, said Aktaruzzaman, Deputy Director, Fire Service and Civil Defence,Gazipur. The cause of fire and extent of damage could not be known immediately, he added.